Welcome! We're Mel and Sue, long-time pet owners and House Sitters ourselves, and the founders of Mindahome. How did Mindahome come about? Well, we had always been inspired by the friendliness, convenience and novelty of house sitting and the real sense of community it engendered, so it was natural for us to want share that inspiration with others. Mindahome realised our goal to create a better, easier way to match home and pet owners with reliable, experienced House Sitters. It's something we're passionate about, and we're always looking for new ways, big and small, to make the house sitting experience as great as it can be. We're very happy to say that today Mindahome continues to flourish as a leading UK house sitting website, thanks, we believe, to our first-hand understanding of the needs of Home Owners and House Sitters alike. 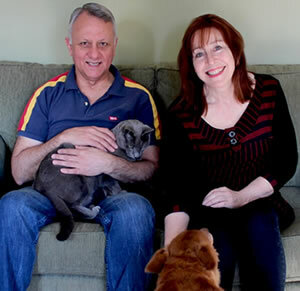 Every year we help thousands of people to easily find minders for their homes and pets. And we help thousands more House Sitters locate a diverse selection of ideal sitting opportunities. So why not come see what you've been missing out on? Discover just how easy and exciting the house sitting experience can be with Mindahome. We'll make you feel right at home! Did we mention how passionate we are? Especially about providing members and visitors to our site with the best experience possible. We're always looking for ways to improve, so we welcome any and all feedback. We'll do whatever it takes to make sure your experience with Mindahome is a happy one. The Mindahome website enjoys an excellent internet profile - which is probably how you got here to begin with! Because we rank well in Google for the main house sitting search phrases used today, Home Owners and House Sitters can easily find us. Don't take it from us—take it from our members. Many satisfied members have taken the time to tell us about their experiences with us. To see what they had to say, visit our Testimonials page here. Getting started couldn’t be easier with our simple joining process. Our website is fast and easy to navigate (and looks good to boot). Searching for Home Owner ads and House Sitter profiles is as quick as it is simple. Each owner ad has a Google map attached showing their approximate location. All house sitting positions can be seen on a Google map UK wide, or by location. Simply click a position on the map to read a brief description, then click its link to go to the details page. It's free for Home Owners to use our website and find their ideal House Sitter. And House Sitters pay just £15 for a 12-month membership, with access to hundreds of house sitting opportunities Australia-wide. Mindahome members all receive our free Guide to House Sitting eBook, an invaluable resource for those new to the world of house sitting.